I have two computers both with Antergos gnome and just did updates on both and in those updates there was an update to chromium browser, after the update finished chromium no longer opens on either machine. I uninstalled it and re-installed, but still broke and that’s on wayland and xorg. Also, tried on another user account, but nothing. Thought I’d let you know. Works on my machines. Have you tried launching it from terminal and see if there’s error messages? Apr 18 20:22:58 empowered64 systemd: Started Process Core Dump (PID 31980/UID 0). Apr 18 20:22:59 empowered64 systemd-coredump: Process 31966 (chromium) of user 1000 dumped core. Thank you, downgrading fixed this for me. As a newer Linux user, this taught me something cool, the ability to revert to a previously working state. How do you know when it’s safe to take the update after this? Should I just make sure the version number is newer and hope for the best? 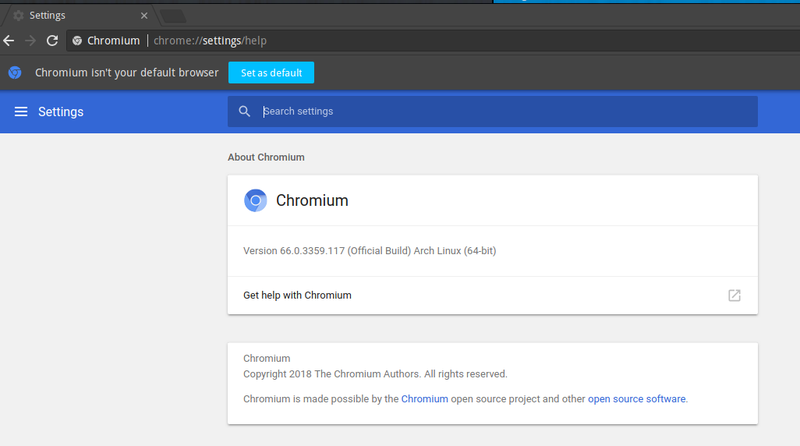 On LTS kernel 4.14.34 chromium 66.0.3359.117 works OK here. How does the problem show itself? Doesn’t it start at all? Or crashes? I’m using latest chromium now as we write and speak. No problems so far. it seem to work … can someone proof? I have that config file and chromium works. The only thing I have there is the –homepage option.